Racerback pinnies the way you want them. Design online today. 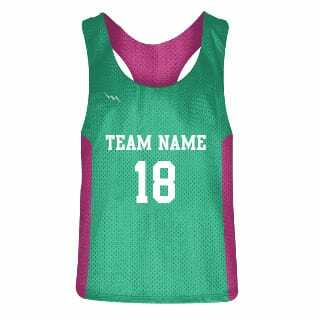 Mesh Lacrosse Penny / Pennies Practice Lacrosse Practice Apparel Womens Reversible Mesh Lacrosse Penny/Pinny/Pennies/Pinnies/Pinnie Ladies Lacrosse Practice Apparel. Tricot Eyelet Mesh, Tank Top, Sleeveless, Reversible Jersey, RACERBACK, 100% Lit Fit Polyester. Light Weight Lightning Fast. Sizes Girls Youth Small - Youth XL and Womens WS-WXXL. Several Styles and many colors to Choose From. This is a slightly form fitting jersey. 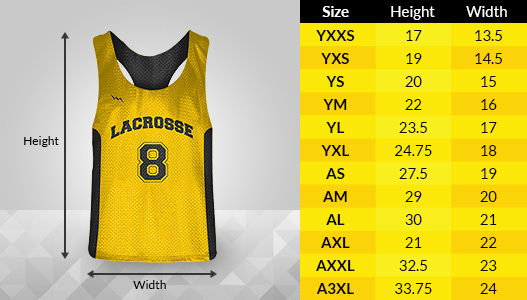 For sizing, order off of your regular tshirt size. Cut, Sewn and Printed in Maryland USA. Click here for size chart information. Great. Thanks again for the Lightning service.